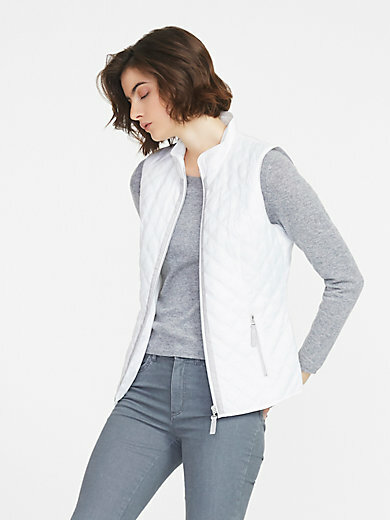 Quilted gilet by Peter Hahn. Exceptionally lightweight warmth! Contrasting colour along the zip and the front edge adds elegant touches to our premium microfibre gilet that is easy to care for and mix and match. Details include double rows of diamond stitching, a zip-through raised collar, two zipped pockets, and an inside zipped pocket. Outer material, filling and lining: 100% polyester. Length approx. 24 ins. Machine washable.